Reminder: buses and trains run on a Sunday/Holiday schedule on Monday. Reminder 2: have a great Labor Day weekend! If you can, step away from the internet slowly. Reminder 3: here’s how to get to the L.A. County Fair using transit. If you’re going, have a fried salad with dressing on the side for me! Go Rams! : Looks like it’s going to be Case Keenum as the starting QB with Sean Mannion as backup and Jared Goff as No. 3. I like seeing NFL teams not rush rookie QBs into the lineup but it’s a little unusual to see a No. 1 draft pick at third string. In any event, 16 days until the Seahawks come to the Coliseum. Here’s how to Go Metro to see the NFL and the NFL-lite (read: college football) at the Coliseum and Rose Bowl. Reminder 4: The Source’s highly-anticipated preseason NFL playoff picks from yours truly and Joe Lemon are coming next week. I know. You can’t wait. It’s probably better to not put your fingers over the camera lens. But who am I to question a marketing campaign? Four letters in response to the LAT article last week on Expo Line on-time performance in June. A couple letters make the point that trains are still more reliable than the vagaries of traffic west of DTLA. That’s a good point. Other readers aren’t so charitable. These are just four letters but I do think they offer a good microcosm of the very different ways that folks in our region approach traffic. Some live with it and others would rather, in their words, ride a hay wagon than sit on the freeway. At this time, I’m sad to report that no ‘Hay Line’ is in the works. But if I ever find a time machine and end up government blogging in the 19th century, I’m certainly going to mention it to the bosses. 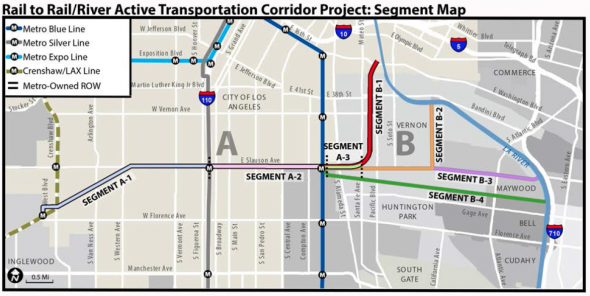 The project seeks to build a pedestrian and bike path in phases between the Crenshaw Line, Blue Line and Los Angeles River. This good post does a good job looking at some of the routes under study — with the east half of thep project between the Blue Line and river posing a lot of challenges. We’ll have more on this soon. A look at some of the groups that are opposing or might oppose Metro’s sales tax ballot measure.Obviously the coin has another side: there are also groups that support the measure. For extremely-caffeinated readers, there’s a long back-and-forth in the comments between an elected official and Streetsblog readers. It’s actually heartening to see a bunch of men avoiding the darker corners of the internet in the wee hours! Here’s the ballot measure page on metro.net. I encourage everyone to spend some time clicking around and looking at the various documents and reading as much press coverage as they can on this and other items on the Nov. 8 ballot. And if you haven’t registered to vote yet — please do so. Related: Over at Curbed, a fantasy map of the Metro system in the year 2090 has been posted. It’s fun but I’ve gotta play Stern Dad and remind everyone that many of these projects aren’t part of any official plan. The program, which will initially only be available in the San Francisco area, aims to swiftly match drivers and riders heading in the same direction to create a seamless, Uber-like ride-hailing experience. The difference? It will be far cheaper and aimed at commuters rather than barhopping Millennials: Drivers get a small reimbursement of up to 54 cents per mile to cover gas and expenses (that’s the maximum you can deduct for business use of a car, per the IRS), and riders are limited to two trips a day, between work and home. I suppose the difference between this and old-timey carpooling is that usually people organize carpoolers themselves or use a service to help match them with fellow carpoolers. Maybe this is smart but I’m not sure I want to jump in a car with any ol’ bloke who happens to be going in the same direction — at least ride hailing companies and taxis make some attempt to hire/screen drivers. Okay, maybe I’m an Old Goat incapable of change. Or maybe I’m smart. Does this service appeal to any of you? You are also free to comment on whether I’m smart, unsmart or reek of complete mediocrity. It’s funny. I was recently sitting in a car in heavy traffic in Chinatown thinking the same thing: where are all the cars? Putting aside the clickbait headline, the article — which relies heavily on data from Uber — shows that ride hailing has become popular in the L.A. area, but doesn’t really show that car ownership rates have dropped. There’s an interesting nugget about one man who explored the cost of car ownership versus ride hailing. I think you could get a better deal than a $458 per month lease and I would also suggest that it’s probably better to own than lease. Its better to lease than to own a depreciating asset. Owning a house that can increase its value with time is a good thing. Owning a car that decreases in value from the moment you drive it off the lot, bad. That depends. You lease a car for only 20 years, and you’ve probably paid for it several times over, whereas if you buy it outright, you can keep it until it’s time to tow it to its final rusting place. On the other hand, you buy a car, and then trade it in after only 5 years (or less), and you’re probably better off leasing it. How am I getting to my Labor Day destination? Well because my plan is to spend at least part of the day LABORING at the International Printing Museum (while it’s closed), to help prep it for the 8th Annual Los Angeles Printers Fair (October 1st), which isn’t especially easy to get to by transit from Orange County, I have little choice but to drive in, the same as always. But the retired printer I’ll be meeting for lunch will likely be taking a bus to the restaurant. And if I run out of work to do early enough, I could conceivably end up taking Metro into L.A.
Oh, and as to freeway delays vs. transit delays? The delays that bother me the most are the delays that make it difficult to get to a concert on time, whether they’re freeway delays, transit delays, or restaurant delays. Delays? I’m not likely to notice any, since local routes are up to 30 minute headways when I usually ride. BTW the closest buses to the IPM are Metro and Torrance Transit on Vermont Ave, about 1/2 mile. I’ll be using Waze carpool the second is launches in LA (I was hoping Lyft would expand theirs first). I’d love to take the bus to work, but it only runs by my house once an hour, which is a dealbreaker. The carpool would let me ditch my car, if it works out. Transit delays bug me the most. Maybe it’s just a run of bad luck, but I’ve lost several fares lately at Sierra Madre Villa. After tapping and going to the platform I see that it’s 17 minutes until the next train. So, it’s back to the car and I’m in Pasadena before the train makes it to Sierra Madre.